Storytelling is a natural talent available to everyone. When you were five, you were a born storyteller. We all were. But sometimes life gets in the way of our ability to connect to wonder – the place a five-year old lives all the time. In order to reconnect to that place of wonder, the place where hope lives eternal, Doug Lipman takes us back to what we have forgotten and shows us how to again become what we once were. One way to end isolation is to find someone to listen to us. Really listen. And Lipman shows us the power of appreciating hearing a story in others and ourselves. Lipman believes in our unique ability and provides clear direction on how we can return to our own source. Storytelling is the most fundamental part of oral communication. Our lives are full of TBU’s – facts that are “True But Useless.” Working with story allows us to deliver the message wrapped in the emotion necessary for change. No emotion – no change. There are an infinite number of ways to approach narrative. Lipman gives us clarity around which way is most comfortable for us. People learn best when they control their own learning process. 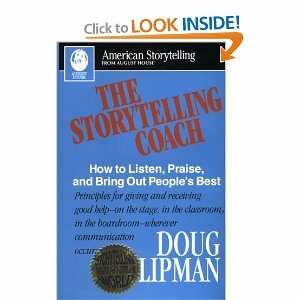 Lipman is a great coach – and gives us the impetus necessary to take charge of our own story – our unique voice. Whenever we meet up with other people, we tell stories. Whether at a business meeting, coaching a team, making sales presentations or out on a date, we tell stories. This book is for anyone who uses spoken communication and wishes to bring positive results to the process. Definite soul food for any teller! This entry was posted in Corporate Storytelling, Storytelling. Bookmark the permalink.